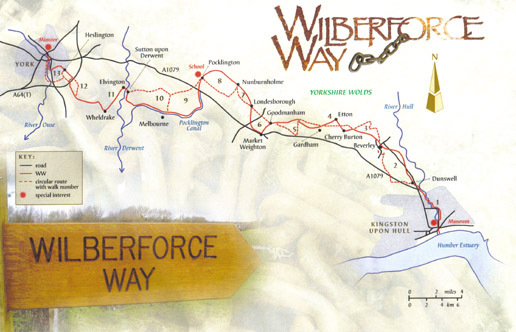 The Wilberforce Way (published in 2007) celebrates the bicentenary of the abolition of the transatlantic slave trade by that determined Yorkshireman William Wilberforce. The 60-mile trail starts in Hull (where Wilberforce was born), goes through Pocklington (where he went to school) and finishes in York (where he was declared MP for Yorkshire). It is the first of John’s walks to be signposted and is divided into 13 separate but interlinked day walks. It includes locations of special importance in the struggle for human freedom and dignity as well as visiting delightful landscapes and places of more general interest.